Ole Bluey has many features including unobstructed views of Taramea Bay. Just walk across the road onto the beach. Two bedrooms are in the main house, one downstairs, each with a bathroom attached, the other bedroom is part of a self contained sleepout situated at the rear of the property - perfect for teenagers or visiting guests. There is a modern kitchen with attached dining room with a seating area to enjoy some quiet time. A separate lounge offers plenty of seating for entertaining and bi-folding doors that open out to the large deck where there is plenty of outdoor seating and a gas bbq makes for easy entertaining. Any damage to property maybe charged to the renter. The view and access to the beach is second to none. When you are sitting in the house it feels like you are floating on the water. 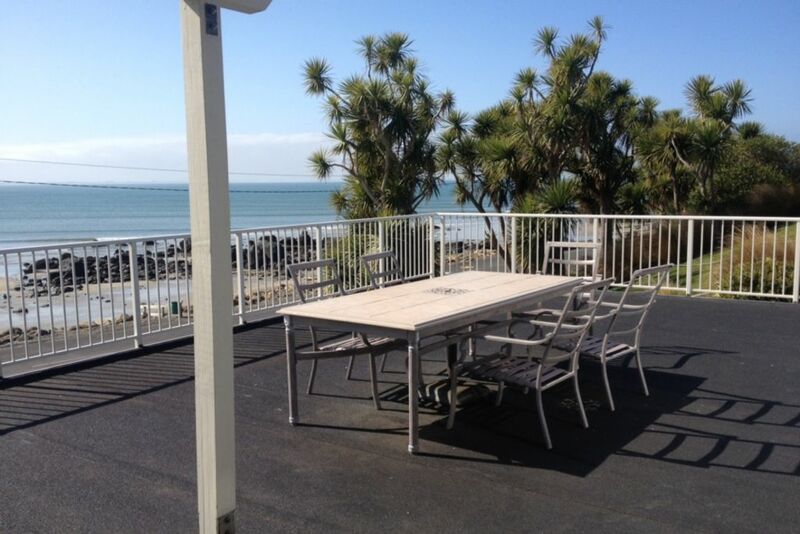 Fantastic views, beach just over the road, plenty of space for the family, comfortable beds, clean and tidy, three bathrooms! In fact everything we needed for a great few days in Riverton. We saw dolphins on the first morning right from the deck! Amazing! This accommodation is very clean, lots of room and a huge deck overlooking the water. The pictures don’t do it justice. The only thing missing is wifi. Thank you for a great stay! The house is very comfortable and clean and in such a great location. We look forward to staying again! From the minute we walked in, this place was amazing all the comforts of home. Very clean and comfortable. We will be back - highly recommend. We liked that it was within an easy walk to The Rocks restaurant and having the sea just over the road. Thank you Christine for your kind words. You are welcome any time. A lot of thought has gone into the positioning of the internal windows so that you can take in the lovely view from the common areas. This house is clean and tidy with comfy beds. We will be back for another stay. Safe swimming beaches with great waves ideal for surfing, body boarding, kayaking or paddle boarding. Lots of rock pools with keep the kids entertained for hours. Lots of local walking tracks, surf school and fishing charters. Riverton is a quiet coastal town with loads of personality, offering a well stocked supermarket, an art gallery and museum with lots of quirky shops and cafes and restaurants. Invercargill is a 40 minute drive.